Have you looked into the night sky yet? I mean lately, like in the last two days? You really should. Mars is very very visible to the nekkid eye. It is the closest it has been to earth in the last 11 years. It's only a mere 47.2 million miles away. Had it been this close last October, it wouldn't have taken nearly as long to save Matt Damon. We could have shaved off a few weeks of that return flight. Shortly after sundown, just look up to the south eastern sky. No telescope needed. You see it easily. No squinting necessary - and yes, it is red. Well....reddish. 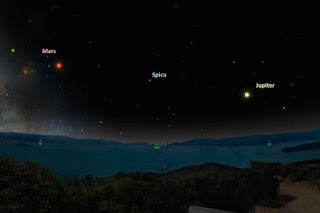 I'm not up at 01:00, but if I were, Mars is at its highest point in the sky. And starting tonight, you should - well we - be able to see Jupiter too. Not "the" Jupiter 2 - because that was the spaceship the Robinson Family and Dr. Zachary Smith were on. Allegedly, with binoculars you will be able to see Jupiter's four biggest moons. I don't have binoculars, so I won't be seeing those. But I will go out and look. This is going off my astronomy post a week or so ago - but for no good reason, I just marveled at being able to look up and see Mars - from the yard, the drive or even the kitchen window. It was just there. Now tonight, I'm going to find Jupiter. I saw Mars but had no idea about Jupiter!